The skiing here at Kittelfjäll is better than I had expected. There's not much snow, but still enough that it's possible to ski. The trick is to find the slopes that are a bit out of the way. Yesterday we found a few nice areas in the trees where there was plenty of nice snow. Tonight is New Year's Eve, so we will no doubt stay up late drinking champagne. I have taken lots of photos, and will post some soon. _MAL5242.jpg, originally uploaded by Michael A. Lowry. Christmas Day, I caught a ride back to Stockholm with Lena and Lotta, caught a few hours of sleep, and then went to a dinner with friends. I was invited by fellow salsa dancer Evert, and the dinner was held at the home of another dancer, Robban. I was pleasantly surprised to see lots of familiar faces there, including Helena, Jose, Leo, and my charming dance instructor Marina. Robban prepared a delightful meal, afterward we all caught the subway down to Medborgarplatsen for the second annual Christmas salsa party at Debaser Medis. It was a lot of fun, but I had to leave after just a couple of hours because I was too tired. At the time, I was still recovering from the cold I’d caught a few days before. Here are the best 38 photos from the evening. _MAL5211.jpg, originally uploaded by Michael A. Lowry. Yesterday afternoon I took the express bus from Stockholm to Norrköping. Lotta met me at the bus station, whence we drove to her parents’ home in Östra Husby, a small village twenty minutes East of the city. This morning the sun rose shortly after nine, and peeked through the clouds for a little while later in the morning. Before lunch, I helped Kurt move some furniture up into the attic for storage and went to the grocery store to pick up a few last-minute items. Tonight we had a lovely Christmas Eve dinner of pickled herring, potatoes, ham, Brussels sprouts, peas, meatballs, and ‘princekorvar’, small hotdog-like sausages. For desert we had a delicious apple pie Lena made with apples from the trees in her garden. After dinner we retired to the living room to open presents (people exchange giftss on Christmas Eve in Sweden and most of the rest of Europe). I'm coming down with a cold so I'm not feeling very well at the moment. I think the worst is past though, and I hope to be feeling better in the morning. I wish everyone a wonderful Christmas! _MAL5042.jpg, originally uploaded by Michael A. Lowry. 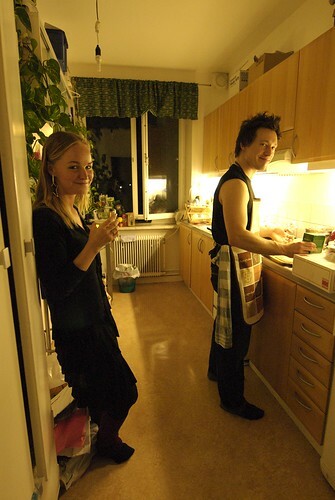 Last night I went over to Maria & Johan’s place for a lovely Christmas dinner. I met Maria last year on the trip to Idre Fjäll. The dinner was delicious. I especially enjoyed Johan’s excellent homemade meatballs. This afternoon, I’ll catch the bus down to Norrköping, where I’ll spend a couple of days with Lotta and her parents. _MAL4718.jpg, originally uploaded by Michael A. Lowry. 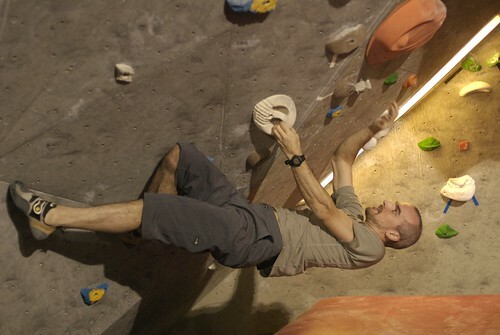 Last night was boulder open #60 at Karbin. I did the best I could, but it was certainly not my best performance to date. I completed 16 problems, a bit off my record of 26! Still, I had a good time and completed a few tricky problems. Here are a bunch of photos from the evening. _MAL4684.jpg, originally uploaded by Michael A. Lowry. Friday I took the subway out to Alvik to join Karin for lunch. We walked to the sushi place. I have to admit that in wintertime, I enjoy the miso soup even more than the sushi. _MAL4563.jpg, originally uploaded by Michael A. Lowry. Last night I joined Stina and some of her friends to taste five or six different varieties of glögg. Stina’s friends were all new to me, except for Eleanor, whom I met briefly last year at Kittelfjäll at the same time that I met Stina. Speaking that, Stina and I have booked a skiing trip up to Kittelfjäll over New Year’s week. I’m wondering whether this is a good time to buy a pair of skis. I really liked the Head Supershape Speed skis I rented in Åre last weekend, and have half a mind to buy a pair. But of course it’d be less expensive to get them at the end of the season, and even cheaper to get them when I visit the U.S. the next time. The ride up to Kittelfjäll is on one of those sleeper busses, and one usually sleeps the whole way there and back. Unfortunately, Stina and bought the last two tickets, which means we got seats instead of beds. Oh well, I’ll bring my neck pillow and make the best of it. Let's just hope the bus stays on the road this time. _MAL4507.jpg, originally uploaded by Michael A. Lowry. Yesterday afternoon I took a walk down to the water’s edge just after sunset. 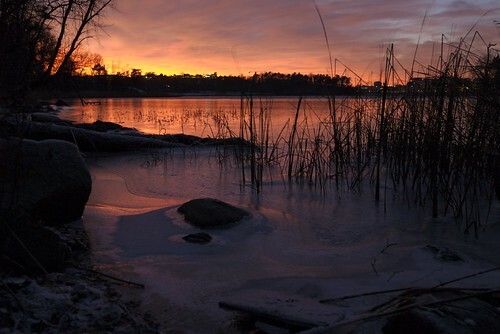 The horizon turned to a bright fiery orange, and I knelt down to capture the sky’s reflection in the ice. The temperature has remained just below freezing for a few days, and it probably won’t be too long before it’s possible to skate on the lake. _MAL4417.jpg, originally uploaded by Michael A. Lowry. Tuesday evening I went to Klättercentret for a bit of bouldering. It was the first time for me to see Matt & Lisa since returning to Sweden. Lisa and I an planning to thrown a combined party for our birthdays sometime soon. Our birthdays were in November, but the party probably won’t happen until mid-January at the earliest. Stay tuned. 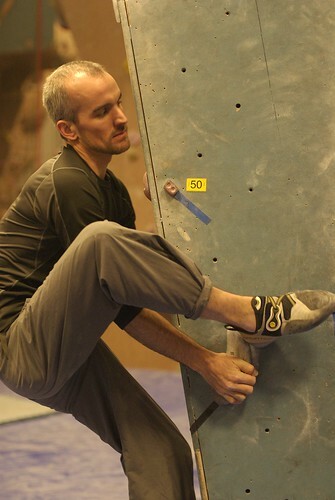 The bouldering problems were a lot of fun. I conquered a few that I had tried last week but hadn’t managed to finish then. Pierre gave me some good tips on several tricky problems, and I think I’ll be able to complete a couple of them next time. Miranda & Kalle were there. They’re up from Lund for the holidays. I gave Miranda the climbing gear I’d brought her from the U.S. and she seemed pleased. She said she plans to put it to good use when she goes climbing in Spain in a couple of weeks. I’m jealous! Here are the nine photos I posted. Miranda’s sister Josefin was there too, and she took lots of photos with her camera. She posted them to Facebook, if you want to see them. _MAL4355.jpg, originally uploaded by Michael A. Lowry. Monday I joined Åsa for lunch. Åsa’s colleague Phil joined us. 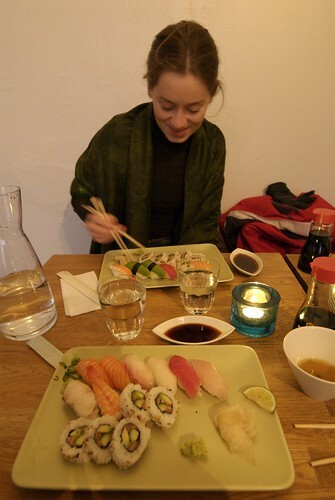 Åsa often works in the South part of the city, so it's not every day that we can meet for lunch. I had lamb curry from the Indian joint. This past weekend, Åsa & Patric went skiing in Trysil, Norway. They had both great snow and bright sunshine! Lucky bastards! _MAL4058.jpg, originally uploaded by Michael A. Lowry. The last day in Åre was fun, but I think we were all quite tired. It's a good thing we were there for only three days. If we’d been there longer than that, I don’t think we would have been able to maintain that pace of activity. Early yesterday morning, we packed our bags and cleaned the apartment in time for it to be inspected at check-out time, 9.00. 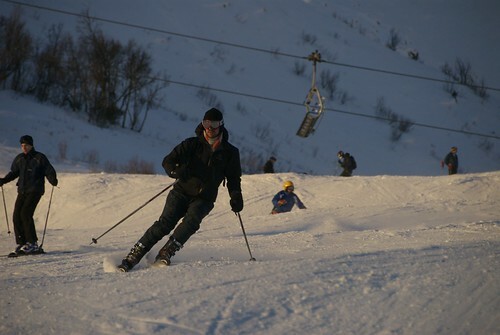 We then left our bags in Robban’s car and hit the slopes. After a quick lunch at Olympia Restaurant, everyone but me and Magnus piled in the car for the drive back to Stockholm. Magnus and I said our goodbyes and then returned to the mountain, where we skied another couple of hours. After a quick sauna and shower, I threw on a fresh change of clothes and went to catch the bus to the airport. Magnus’s train left about an hour later. The ride to the airport was about an hour long, and I slept the whole way. I also slept on the flight to Stockholm and the bus from Arlanda to the city. I guess I was tired! I’ve posted about 70 photos from the weekend. The snow wasn't as nice today. No new snow fell last night. Two of our gang awoke just after 4.20 and took the lift up to the top for a free breakfast. This is, of course, the one lift that's open 24 hours per day. The lift is closed from 5.00 until 6.00 while the slopes it serves are groomed. Those brave enough to make it to the top before 05.00 are treated to a free breakfast. I was not among those folks. I slept until 7.30. After a quick brekfast, we hit the slopes. We had a good day of skiing, and were treated to sunshine for at least 3 hours. We went to Bygget for after-ski life music, fixed pasta for dinner, and had a quick sauna. Now we're going out! Signing off from Åre. I caught a flight up to Åre early this afternoon to join Stina and some of her friends for a weekend of skiing. Stina's friend Magnus flew in this morning from Göteborg, and had already been skiing a bit when he met me at the cabin where we're staying. Affer I dropped off my bags, I walked down to the ski rental shop, located just 50 m from our door, to rent equipment. I opted for the "advanced" ski package and got what look like brand-new skis and boots. Shiny! We hit the slopes around 15.30, just as the majority of the lifts on the mountain were being closed for the day. The only lift left running was the VM 8 lift. There's a single ski slope down from the top of that lift that is brightly illuminated all night long (24-hours per day actually). So we stuck to this slope, sking until almost 17.00. The snow was probably great this morning, but by the time we go to it, it had been cut up pretty badly. There were patches of hard icy snow and thick clumps of heavy wet snow. Inconsistent snow makes for challenging skiing, and I fell a couple of times. These skis are really amazing. They're sharp and hold contact with the ground very well. This actually caught me by surprise one time, leading to one of the falls of the day. I caught a bit of air jumping over a clump of chunky snow, and landed on a flat icy patch. My uphill ski caught the packed snow and came off in an instant. I might tighten the bindings a bit tomorrow. The sun set around the time we began skiing, and was followed by at least an hour of dusk. The thin reddish-orange cresent of the moon was silhouetted against a deep azure sky. A light veil of low clouds was switfly passing overhead. Eventually, the clouds became thicker, and as we finished skiing for the day, the moon and sky had become completely obscured from view. Around 17.00, we dropped off our skis and we changed into regular boots so we could comfortably walk into town to do some shopping. First we picked up some wine & glögg at System Bolaget, because they close at 18.00. Next we bought dinner and breafast fixings at ICA. We're gonna have tacos tonight, preparing dinner just in time for the arrival Stina and the rest of the gang. They are driving up from Stockholm. I brought my camera with me, but I haven't taken any photos yet. I didn't dare to bring it with me on the mountain today. I will have to get very comfortable with my equipment and the snow conditions before I'll dare to bring my expensive little toy up with me. I might bring it up on the mountain tomoorrow, but I kinda doubt it. Maybe if the sun comes out and it's a really lovely day. _MAL3828.jpg, originally uploaded by Michael A. Lowry. Tonight I met Emma in the old city to enjoy a bit of music and candlelight in the big church beside the square. The music was quite good. I'm not such a big fan of Kraus, even though he may be buried on the shore of Brunsviken near my home. But the traditional Christmas and Lucia songs were delightful. I wish they'd try some more challenging choral works like in years past! By coincidence, Emma saw a friend of hers there. He works as a physical education teacher at Adolf Fredirks school and was helping out with the production. He told us that the king and Kofi Annan had been at the earlier performance tonight. We were “mingling with the elite,” as PO put it. Here are a few photos from Storkyrkan. _MAL3819.jpg, originally uploaded by Michael A. Lowry. 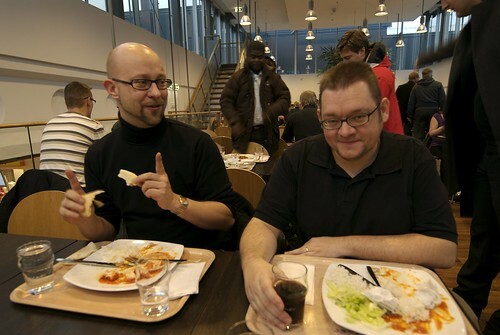 Thursday at midday I joined PO and Daniel for lunch at Kista Galleria. I had brought some goodies from the U.S. for the gentlemen, so that was the first order of business. We had Indian food, and by the time I finished my food I was stuffed. Because I'd had glögg and gingerbread cookies in the morning, the big lunch was a bit too much. After lunch I went by the bank to take care of some problems with my credit card account. I recently opened a private account that earns 3.25% annually. When I opened this account, I moved most of the money from my old savings account to the new account. The bank told me they'd take care of setting up automatic payment of the credit card and loans so that these payments were made from the new account instead of the old one, but apparently they didn't do this. This oversight caused me a big headache when the payments were not paid. The bank has now fixed everything and waived the late fees that had been levied. _MAL3759.jpg, originally uploaded by Michael A. Lowry. After more than two months of salsa-abstinence, I hit the dance floor at La Isla last night. Anna joined me, and we took the drop-in course together. It was a bit of a weird lesson: at once too easy and a bit awkward. The dance floor was too crowded too. Oh well—I guess it can't be a great lesson every time. After the lesson I stayed and danced with a bunch of friends I hadn't seen since before my trip to Austin. Around ten o'clock, Anne Lene showed up and we danced a few dances too. Her friend Felix was there too, and I got some nice photos of the two of them dancing. Here are all 13 photos from the evening. _MAL3608.jpg, originally uploaded by Michael A. Lowry. After two months away from Stockholm, I returned to my usual Tuesday night routine last night, climbing a few hours at Klättercentret. Last night, it was just bouldering. I had a good time and to my surprise did a couple of rather tricky (black-graded) problems. The skin on my hands is not as tough as it used to be though, and I cut up my right index finger a bit on one of the grips. Tougher skin takes time to build up. I'm sure in a month or so I'll have nice callouses again. When I went upstairs, I ran into Emma and got a few nice photos of her trying a fun problem. I also met some friendly folks named Björn & Emma, whom I hadn't seen there before (Emma must be one of the most popular names for girls in Sweden). Later in the evening I saw Anna and Lotta there too. Here are the best 24 photos from last night. _MAL3573.jpg, originally uploaded by Michael A. Lowry. 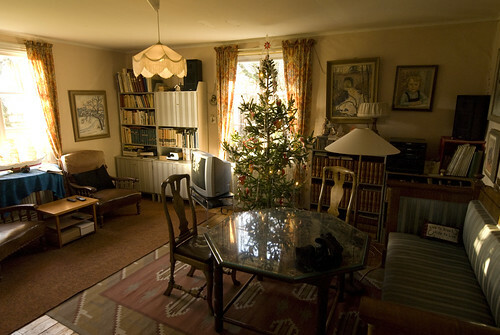 Sunday afternoon, I went downtown and joined Karin and some of her friends for an Advent fika at her place. We made candy and gingerbread cookies, and tried several types of glögg. And of course the place was illuminated by candlelight. It was a perfect way to start the winter holiday season. I posted 22 photos from the fika. ActeryxThetaAR.png, originally uploaded by Michael A. Lowry. 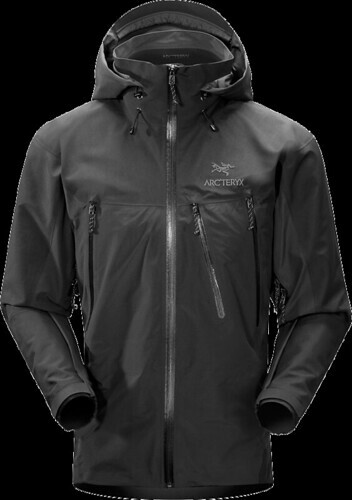 I picked up an Arc'teryx Theta AR jacket at REI on the way to the airport yesterday and I've already put it to good use. The weather is nasty here in Stockholm, with gray skies and cold drizzle dominating the forecast. Despite the weather, it’s good to be home. Tonight is the night of the Nobel Prize ceremony at Stockholm City Hall, so that’s the topic on all the morning news programs. 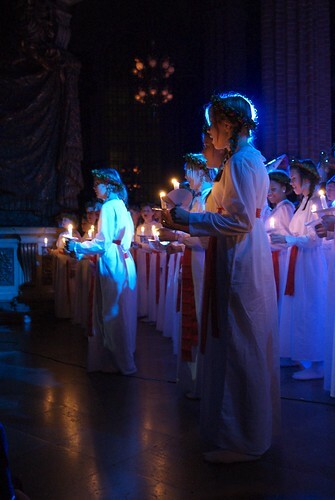 I’m looking forward to Lucia on Thursday. I plan to go to the concert at Storkyrkan in the old city. I’ve attended that concert several times, and it’s always a rewarding experience. Beautiful music and candlelight are excellent antidotes to the melancholy of a Stockholm winter. _MAL0016.jpg, originally uploaded by Michael A. Lowry. Here is the most recent addition to my camera bag, a Zoom-Nikkor 14-24mm f/2.8 lens. 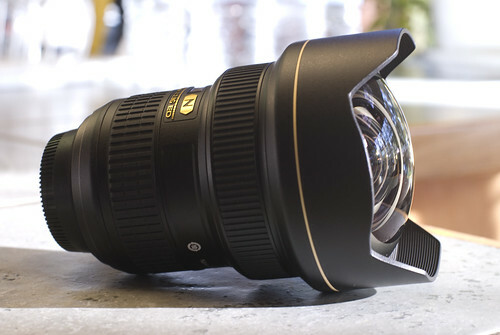 This is my first ultra-wide zoom lens, and after just a month on the market, it's getting rave reviews, besting most other ultra-wide zoom lenses on the market and matching or surpassing many wide-angle prime lenses. The lens is a monster. It weighs a kilogram and the bulbous end of the lens protrudes quite a bit, especially when zoomed out to shorter focal lengths. I’m going to have to be extra careful with this baby to ensure that the glas does not get scratched. I've taken a few shots with the lens and I'm very pleased with the results so far. _MAL0018.jpg, originally uploaded by Michael A. Lowry. A couple of days ago I finally got around to replacing my old Merrell boots, whose soles kept coming off. The helpful folks at REI took back the old boots and knocked a big chunk off the price of a new pair. 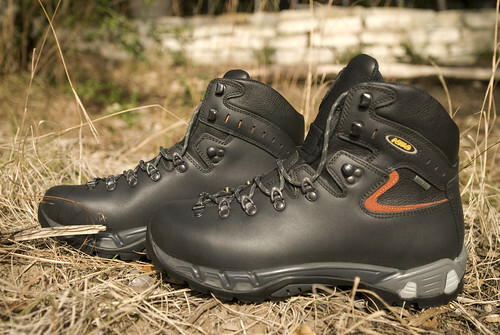 I opted for a pair of Asolo Power Matic 200 GV boots. The leather boots have Gore-Tex, Vibram soles, and neat little brass pulleys for the laces. _MAL0099.jpg, originally uploaded by Michael A. Lowry. Last night I joined Ethan and Dave for some bouldering at Austin Rock Gym. 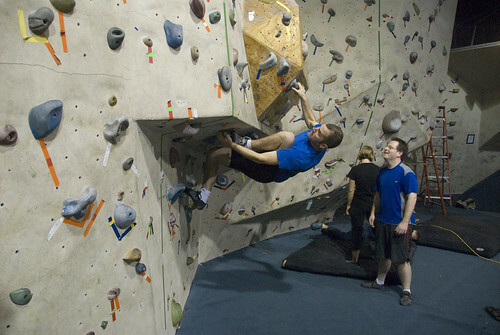 It was my first time to do any indoor climbing in the U.S. The bouldering problems here are graded according to the ”Hueco” grading system, developed here in Texas at the Hueco Tanks State Historic Site. In this photo, Ethan does a hand-foot match on the way up from under the overhang. Last night was Dave’s first time climbing. He did alright considering that! Prior to last night I hadn’t done any climbing in more than two months. My strength has deteriorated noticeably and the skin on my hands has lost some of its toughness. Even so, I was pleased with the climbing. I even did a couple of rather tricky problems. I have missed climbing! 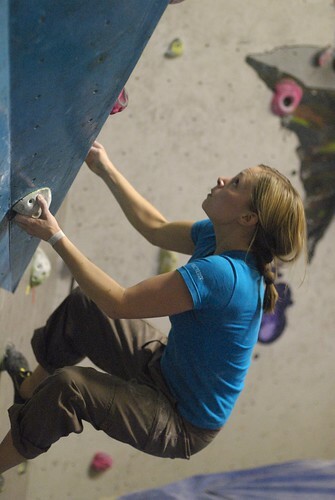 I'm looking forward to returning to my home turf and resuming my routine of climbing twice or three times per week. _MAL0027.jpg, originally uploaded by Michael A. Lowry. I have a cute niece! _MAL0036.jpg, originally uploaded by Michael A. Lowry. I had lunch the other day with Ethan, Kelly, and a few other friends. Mike Kiser came, as did Dave Hill and a colleague of his named Brian. 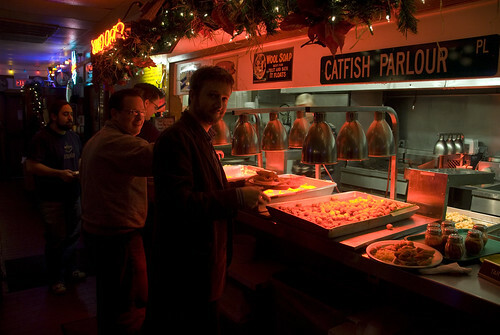 If you like fried catfish, it’s hard to find a place that makes it better than Catfish Parlor. I had the spicy fried catfish along with fried okra and yellow corn. As is my custom, I washed it all down with a frosty mug of root beer. _MAL0017.jpg, originally uploaded by Michael A. Lowry. No, not my cat Sasha. Another one. This Sasha is an old friend from my days at UT. We haven't really kept in touch, but a couple of week ago I managed to track her down. 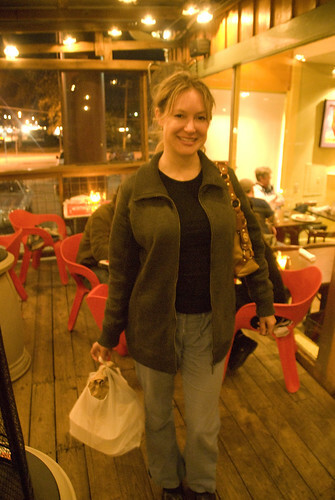 Monday night we met up at El Chile restaurant on Manor Road for a nice dinner. On Sasha’s advice I tried the spicy orange margarita. It's quite tasty. I also enjoyed the enchiladas with red mole sauce. It's fun to get reacquainted with old friends! Swedish wilderness, here I come! _MAL0006.jpg, originally uploaded by Michael A. Lowry. I've lived in Sweden for more than seven years but still haven't gone backpacking in the country’s expansive wilderness. That will change soon. 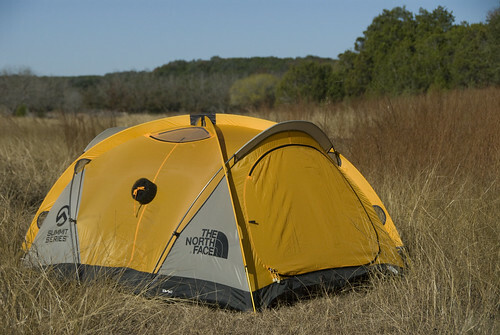 On Saturday I got a new tent at REI — a “Mountain 25” tent from The North Face. My mom and dad offered to get the tent for me as an early Christmas present given that I won’t be in the U.S. for the holidays. I set up the tent in the meadow this morning. I think it’ll do just fine. With the rainfly, it’s a 4-season tent. That means I could even go camping in the snow if I were so inclined. I’m going through all the old camping gear in the garage and trying to scavenge the usable equipment that's reasonably lightweight. Much of the stuff is too heavy for backpacking. When I went camping with the Boy Scouts as a youth, we went to most of our campsites by car, so weight wasn’t a big concern. I thought we had a couple of MSR stoves, but so far I haven’t had any luck in finding them. I also know I’ve got a 4-season sleeping bag hidden somewhere in storage. I’ll hunt for these items more later on in the week. 2. I don’t know how best to import a car from the U.S. to Sweden. Solving problem 1 will just take time. I’m saving my money and trying not to buy things I don’t really need. Regarding the car, I probably should have used the loophole in the law that allows for the tax-free import of a car as an item of one’s personal belongings when one moves to Sweden. Unfortunately, I think it's probably too late for me to take advantage of this. I moved to Sweden in August of 2000. It seems to be very expensive to import a car directly to Sweden from outside the E.U. The Swedish Custom Service has a web page indicating that one must pay 10% in customs fees on top of 25% in sales tax when importing a car to Sweden from any country outside the E.U. Importing a car from another E.U. country though is tax-free. So I'm thinking I could avoid Sweden’s high import duties and taxes by importing via a third E.U. member state. If anyone has ideas on this, please get in touch. Saturday morning I’ll catch my flight to Newark and then continue on to Stockholm. 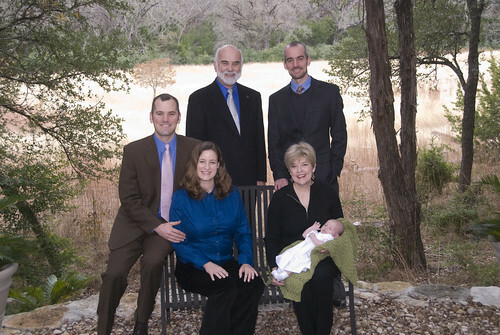 I’m excited about returning home, but I’m also sad to leave my family. 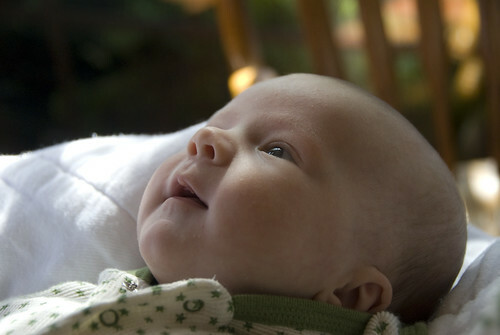 It has been a real treat to get to know my niece Evelyn a bit, and I regret that I won’t be here to see more of her first year of life. Right now I’m taking a little lunch break from writing the redbook. I’m a bit behind on the writing, and will probably have to do at least some of the writing after I have returned to Sweden. The book is exciting to write though, an I’m learning a lot about the new version of TWS. OK, time to grab a quick bite to eat and then get back to work! _MAL0003.jpg, originally uploaded by Michael A. Lowry. Today a photographer came by to take a few family portaits for us. He agreed to take one with my camera, and here it is. I think it turned out great. By the way, this is my first blog entry made from my new iPod Touch!